It is legally trailable world-wide behind a family car. One person can assemble and rig it in under an hour ready for launching with no heavy lifting (e.g. the mast is raised using the trailer winch). The Wizard is roomy. In its 22′ length there are 5 berths in 3 cabins for privacy (3 singles in the hulls and one double on the bridge deck), a separate toilet compartment. Galley and a dinette seating 5. There is standing headroom in the galley using a “pop bottom” in the bridge deck. 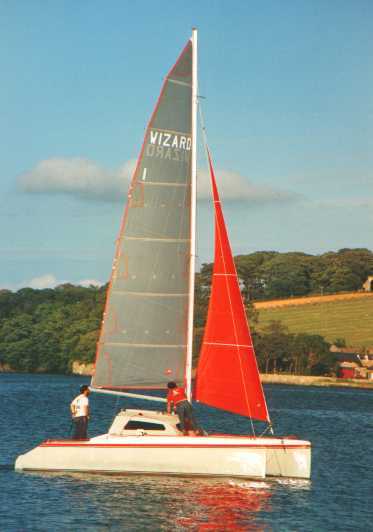 It is fast, the computer predicts speeds of 10 knots under power (with a 15hp outboard) and 16-18 knots under sail (with the racing rig). These prediction have been well proven many times in practice. Yet it remains maneuverable and easy to sail single-handed. It has shallow draft and is beachable.